Secure the success of your next big event with the help of Douglas Entertainments. From live bands to skilled DJs, we provide you with everything you need for a fun, memorable party. So relax and enjoy yourself – we’ll keep the music playing, your guests dancing, and the mood light and fun. Let’s get the party started with exclusive entertainment services from Douglas Entertainments of Baltimore, Maryland. We’re backed by more than 35 years of experience in the UK, Ireland and the US. The Deejays at Douglas Entertainments know how to get your guests pumped and out on the dance floor. Family owned and operated, we offer a level of personalized service you won’t find anywhere else. We are committed to making your day special and maximizing your entertainment budget. Call us for more information about our services. Covering Maryland, DC and Northern Virginia for all weddings, parties and corporate events. When you want professional deejay services, choose Douglas Entertainments. To provide professional, affordable, and skilled entertainers that give a “WOW” factor to every event! The Deejays at Douglas Entertainments are highly skilled and professional with a wealth of experience to make your event a huge success. Brian Douglas- "The Scottish Deejay"
Brian is often referred to as “The Scottish Deejay” due to his authentic Scottish accent. He brings over 35 years of experience to Douglas Entertainments; from working in his homelands of Scotland and Ireland to here in the US. He is an energetic, interactive and professional Deejay who is able to reach audiences across a wide range of ages and musical tastes to ensure that your guests have an experience of a lifetime. Brian is an articulate and funny Master of Ceremonies who, because of his accent, brings a special and unique dimension to your event. Brian’s main goal at your event is to ensure that you and your guests have a fun and memorable time that they will talk about for years to come. Randy Richmond, who joins Douglas Entertainments as one of its premiere Deejays, brings to your event a unique, personal, and interactive experience. Randy offers a distinctive approach to such occasions as corporate events, holiday parties, reunions, weddings and more, where music and/or Emcee is needed. Randy, with his 30 years of award-winning deejay experience, provides you with an impeccable performance for your special occasion. Using his years of experience in radio broadcasting, Randy is an articulate Master of Ceremonies who knows how to make your event professional and seamless. Randy’s personality evokes fun during events to create the lasting memories that your guests will be talking about for many years. Randy’s mission is to ensure all of your guests are having fun while creating a memorable event. Fill out our Request Form to reserve Randy Richmond or Brian Douglas for your upcoming event. We can build your package that includes sophisticated and timeless ceremony music, a pitch-perfect Cocktail Hour, a one of a kind entrance, well-balanced selections for background and dinner, and of course our reputation of getting everyone on the dance floor and keeping them there. All along the way Douglas Entertainment will work with you to create that once in a lifetime celebration. Every wedding package comes with a skilled, talented, and professional DJ/Emcee, and music specifically tailored for each segment of your reception. Our extensive music library covers every era and genre: Motown, funk, disco, rock, hip hop and of course all the contemporary hits of today. If we don t have it, we will work hard to find it for you. Our packages are built from “The Simply Stylist” to “The Simply Elegant”. We offer a wide variety of packages and design them around you. We work with you all along the way to ensure that you and your guests experience an amazing day that will remain in their memories for years to come. Our packages are built from “The Simply Simple” through to “The Simply Extravagant”. We offer a wide variety of packages and design them around you, we work with you all along the way to ensure that you and your guests experience an amazing day that will remain in their memories for years to come.The packages are built around you but always start with the basic package of a skilled and professional deejay, music and sound system. What you want after that is entirely up to you. You can add extra sound systems, uplighting, dance lighting, karaoke, and if you want a second deejay we can supply that too! Take our Simply Simple package and add a lighting package. You can choose uplights to change the color of your room or dance lights to dazzle & mesmerize your guests and bring the energy of a nightclub into your dancing. The uplights come in a rainbow of colors from which to choose. Match your color scheme or simply create a rainbow of colors; the choice is limitless, and more important, the choice is yours. If you choose dance lights the room will be filled with beams of light; both laser and colorful LED beams filling every corner of the room. The package comes with 10 uplights or 6 dance lights, which is ideal for most venues, however if you need to add more we can easily take care of that for you. The Speaker Stands also become lighting features when they are covered with our specially designed covers and backlight. This gives the deejay the look of sleek club style and pzazz. This is our deluxe package that makes any party or event… Simply Elegant. It starts with our Simply Simple Package then adds the elements of the Simply Stylish package with both uplights and dancelights included. The package comes with the speaker stand covers, which are uplit to the color of your choice, then we add a stylish facade that can also be backlit to the color of your choice. If you prefer no lights it will still give style and elegance to your event. This package brings back the elegance of a bygone era, but upgraded to the 21st century, tailored just for you. 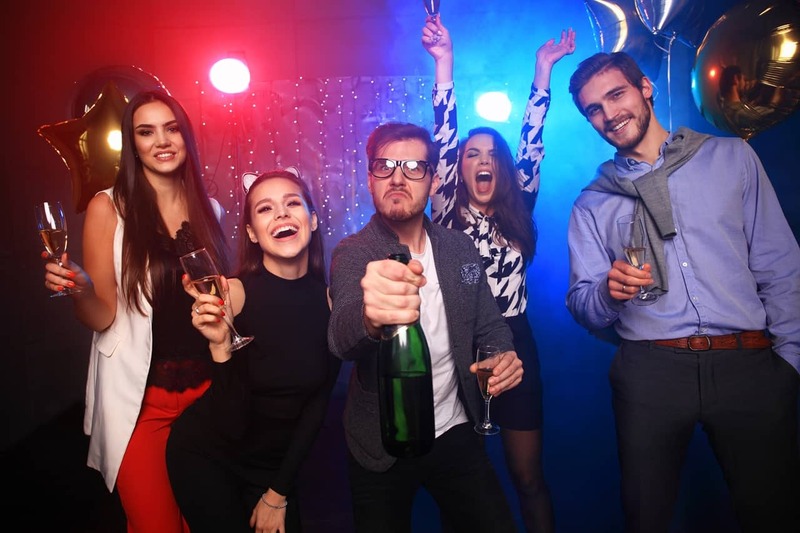 Your party’s not complete without Douglas Entertainments, providing world class and skilled deejay services in the Maryland, Northern Virginia and DC area. Our deejays and entertainers know how to read the crowd and modify their act to complement and enhance the mood. We provide an interactive DJ experiences for all special occasions, such as weddings, dances, parties, bar/bat mitzvahs, corporate events, and more. Our experienced entertainers bring the complete package to your party, including all sound, lighting, and Karaoke equipment. We have access to more than a million tracks, as well as online music. There’s nothing quite like listening to live music. Ensure your next special event is a memorable one with live entertainment provided by Douglas Entertainments. We provide parties with bands and other entertainers appropriate for the venue. As well as our uplighting and dance light packages we can add specialty lighting to your event as well. We can design a Monogram that can be projected on a wall, ceiling or floor using our high powered Gobo Projectors. Maybe you need a follow spot for key moments in the event, or maybe you may need Black lights for a glow party. No matter what your lighting needs, we can build a package designed especially for you. Brian did an amazing job at my wedding!! He contacted me several times before the date to talk about the music, timeline and various other things. I sent him my list of all Disney songs for the ceremony and introductions into the reception. He played everything exactly how I wanted it!! I couldn’t have asked for a better DJ!!! Everybody should use Brian as their wedding DJ! We hired Davis Deejays upon meeting Brain Douglas at the Wedding Expo at the Patriot Center in January of 2015. We later got a letter from Davis saying they were going our of business and we needed to find another DJ. We had paid them up front in order to get the “best deal”. There was NO word on how/if we would get our money back- just that we needed to find another DJ. Brian contacted us a few days later saying he had no idea. (Davis hadn’t even let his own staff know he was going under.) Brian said he would hold our date and give us a greatly reduced rate, AND told us that we wouldn’t have to pay him until AFTER the reception. He was a delight and made our reception so much more fun! He also helped us to restore our faith in our fellow man and we were happy to know that people do honor their agreements. My husband loved that Brian wore a kilt! We highly recommend Brian and thank him again for helping to make our wedding a dream come true! He is aces in our book! I was also a victim of the Davis DJ scam, and my fiance(at the time) and I were scrambling to get a new DJ. Then Brian Douglas called and told us that he was still in if we were. It was absolutely amazing that we found a DJ with the integrity to honor the contract with Davis DJ. He didn’t have to, and we are grateful that he did. He is the most energetic, enthusiastic and funny DJ that we have encountered. Extremely professional, we were quite impressed with him after meeting and consulting with him. During the consultation, he suggested many ideas that we incorporated, and added to the wedding reception. The best DJ we’ve seen at a wedding, and we have family still talking about how great he was. Call him before any other DJ. You will not be sorry. Ask about the kilt when you book him! We were a victim of the “Davis Deejay” rip off. 30 days before our wedding our scheduled deejay decided he was no longer in business, took off with our money (as well as countless others). In a moment when we should have been panicking we stumbled upon Brian Douglas. He worked with us and the transition was seamless. At the reception, I lost track of the number of compliments I got on him. He kept our reception flowing, kept our guests engaged, and made the night incredible. Can not say enough great things about him! Set up, music choice, and unexpected games/announcements were awesome. We were a customer of Davis Deejays who closed it’s doors to us 30 days before my son’s wedding. Brian from DE saved our wedding by calling us directly to make amends for Davis Deejays closing it’s doors and our down payment. We were worried at first to take on Brian as our new DJ. Brian came through for us with the lights, the music, and the monogram were outstanding. We all had a wonderful time. “It was awesome! Thanks Brian! “Randy was excellent. I had previously recommended him for another wedding. Your party’s not complete without Douglas Entertainments, providing world class and skilled deejay services in the Maryland, Northern Virginia and DC area. WILL OUR DEEJAY BE YOUR EMCEE? DO YOU WANT THE DEEJAY TO INTRODUCE THE WEDDING PARTY AS YOU ENTER THE RECEPTION? If yes, please attach list in this order: Parents of the Bride, Parents of the Groom, Attendants (same order they walked down the aisle) Maid or Matron of Honor with Best Man, and finally the Bride and Groom. TOASTS: WILL THE TOAST(S) TAKE PLACE IMMEDIATELY PRIOR TO DINNER? CAKE CUTTING: How long after dinner would you like the Cake Cutting Ceremony? BOUQUET TOSS & GARTER REMOVAL/TOSS; How long after dinner would you like these traditions to take place? OTHER ANNOUNCEMENTS: List any other special announcements to take place, who will make them and when during your event you would like them made. Accessibility Sitemap Douglas Entertainments. All Rights Reserved.